Unfortunately I am having big problems with my internet supplier EIRCOM, last week the internet went down on the 24th August, following a phone call to them they promised faithfully to send an engineer. Of course Ireland having a very large population 4 million + it took a second phone call to gee them up; the engineer came and failed to connect me, he contacted head office who worked wonders NOT, as a consequence of their technical ability I now have no internet connection and the phone line has packed in! I am thinking now seeking another internet provider ! This blog has been initiated by seeing a photograph on the BBC website of a motorcycle, which is to be auctioned off in California. It is a Brough Superior SS100 and the last machine that the company ever made, each motorcycle was tailor-made (designed) by George Brough to each customers specification and the last one was made in 1940. TE Lawrence [Lawrence of Arabia], the British army officer famous for his role in the Arab Revolt during the World War I, owned seven of these motorcycles and it was on one of those that he was killed in a road accident in1935 aged 46. Now part of my time as young boy was filled with reading the account of Lawrence of Arabia's deeds in the desserts; much of which I have now forgotten, but never the man himself. In 1988 I was living alone in Bournemouth and working in Poole, Dorset. After having my evening meals there was that gap of free time to be filled before going to bed, I have never been one to watch the TV much, so I used to go on reasonably long drives and sometimes just to tour around the New Forest. 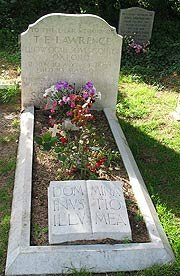 During this period I had heard that Lawrence was buried in Dorset and so on a summers night I decided to visit his grave. Where I found much to my surprise a very modest headstone that gave no mention of this mans great deeds. 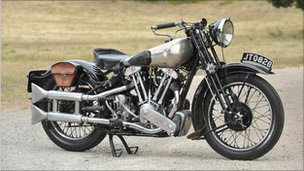 I think that I ought to point out that it is not T.E Lawrence's motorcycle that is being sold! The other day, the weather being fine we took ourselves on a promised trip to visit a Healing Well. Our route took us through Clonaslee (Cluain na Slí) a picturesque village in north county Laois. The name means "way meadow"(road through the meadow), the way referred to was & is an important cross-country route. Clonaslee sits at the foot of the Slieve Blooms and has been almost continuously inhabited since Neolithic times. Our destination lay approximately three kilometres to the north along narrow roads, so narrow that two vehicles would be unable to pass each other, to a sparsely populated area with few houses to be seen. Father Graham's Well was clearly signposted and on turning into the cul-de-sac access road it was wonderfully wide in comparison to most of our route. 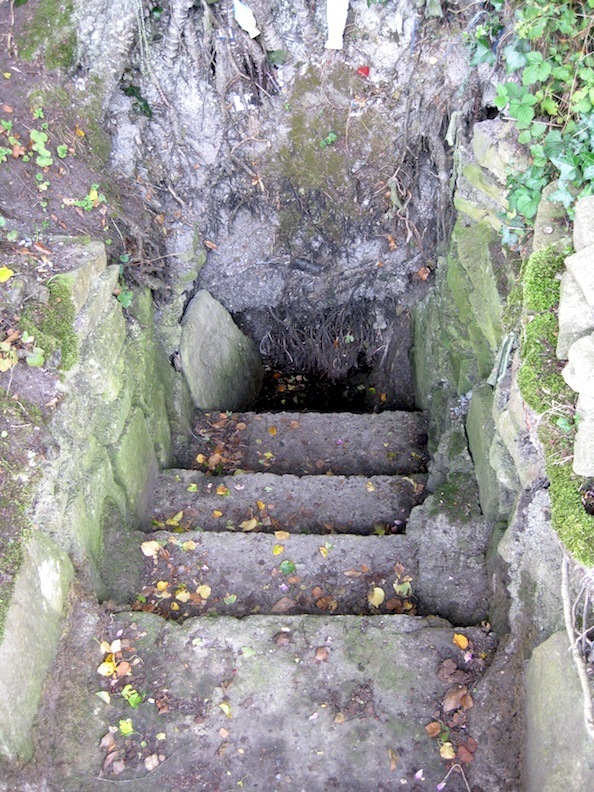 Five steps lead down into the well where the roots of three trees can be seen just above the level of the water; the trees being Birch, Hazel and Whitethorn, an unusual combination. 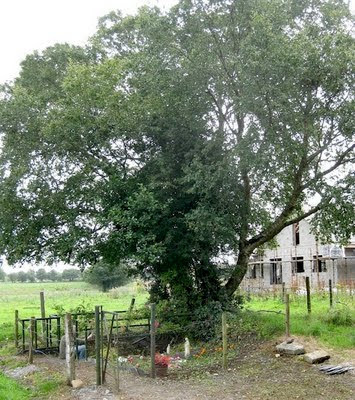 The well is known for having a cure for toothache, headaches and other neuralgic problems, so may be the combination of the three trees plus the mineral content of the water have more to do with healing than the goodly Father Graham. 'Rev. Michael Graham had been curate for a long time before being made P.P of Clonaslee. He died on 11th August 1840 and was buried in the church where an inscription after recording the date of his death says "By his will he left £300 to improve the education of the poor of the parish." A Good Surprise in Leamington Spa ! On my visit to Leamington Spa in December of last year (2010) I was very surprised to see a gleaming white temple breaking the immediate skyline, unfortunately due to the icy roads I was unable to get close enough to take a photo. However on our recent trip the weather was very different, gorgeous in fact and almost too hot: for I am now acclimatised to the much lower Irish temperatures. The Gudwara Sahib (Sikh Temple) is built in the middle of an industrial estate. It stands out like a beautiful bright flame and as we walked closer to the building I sensed a serene energy emanating outwards; I was immediately reminded of the energy that flows outwards from the Irish stone circles that also transmit an essence of peace and tranquility that pervades the busy mind. around, though I very much hope that on our next trip to visit Oliver that we shall be able to see the inside of the Temple. I confess that I know very little about the Sikh's and of their religion even less, except that like myself they are vegetarians and generally peaceful people. without any thought of reward or personal benefit. 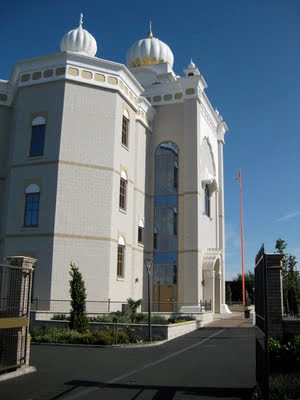 The Sikhs arriving in Leamington and Warwick in the 1950s brought with them not only their endeavour for hard work but just as importantly they brought with them the Sikh faith with its core principal of ‘Duty to serve’ not only the Sikh community but non-Sikh as well."